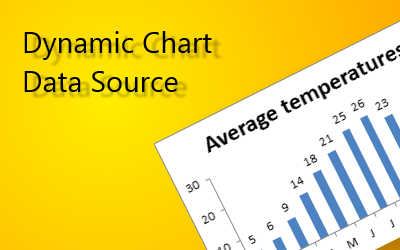 In this article I will demonstrate how to quickly change chart data range utilizing a combobox (drop-down list). The above image shows the drop-down list and the input range is cell range E2:E4. Cell range E2:E4 contains the table names that points to Excel defined Tables located on sheet 2011, 2010 and 2009, see picture below. 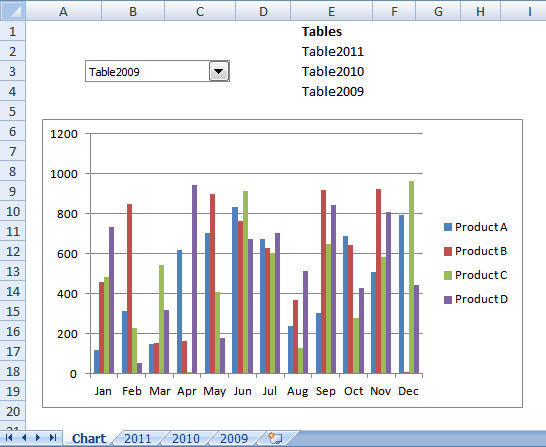 When you select a table name in the drop-down list, the chart is instantly populated and refreshed, see picture above. 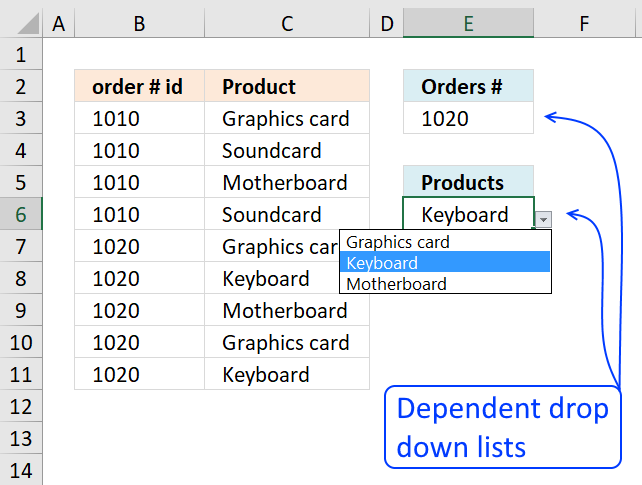 Excel defined Tables are great to work with, they expand automatically when new values are added, this makes charts with data sources pointing to Excel defined Tables easy to work with. You don't need to adjust the cell references when records are added or deleted. 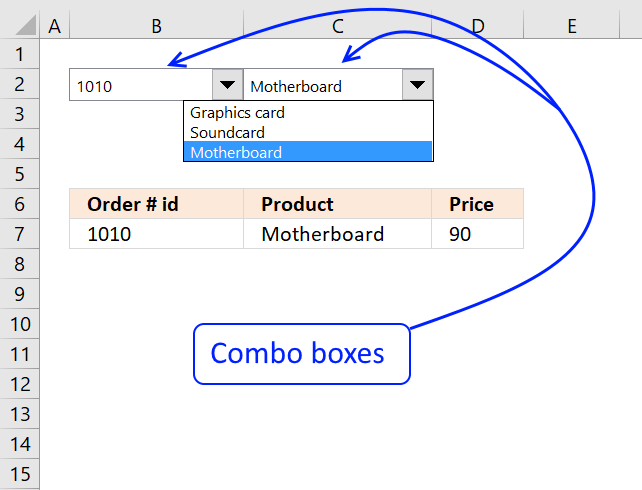 Click and drag on the worksheet to create the combobox. Press Alt + F11 to open the VB Editor. 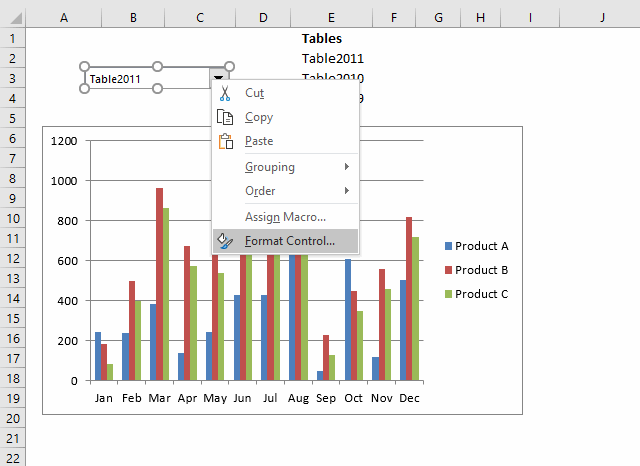 Right click on your workbook in the Project Explorer window. Click "Module" to insert a module to your workbook. 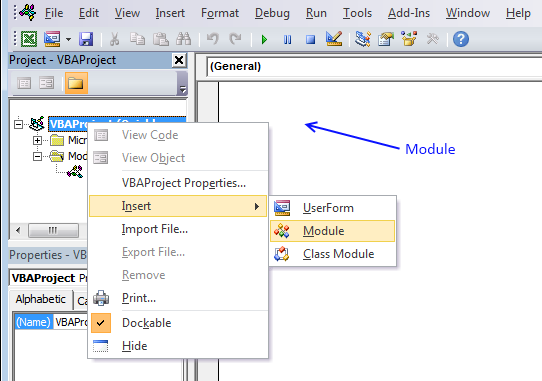 Paste VBA code to the code module, see image above. 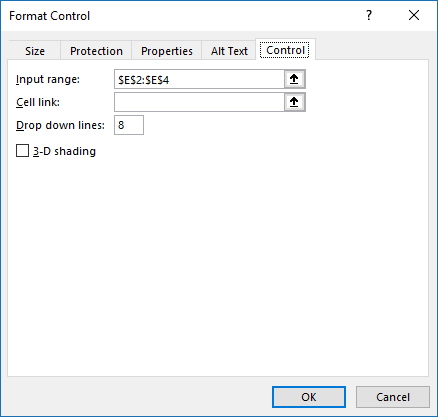 'Make sure the selected drop-down list name is "Drop Down 1"
Click "Format control..." and a dialog box appears, see image below. How would I adapt this to work if I have a number of stacked series in the chart, each with a defined range? 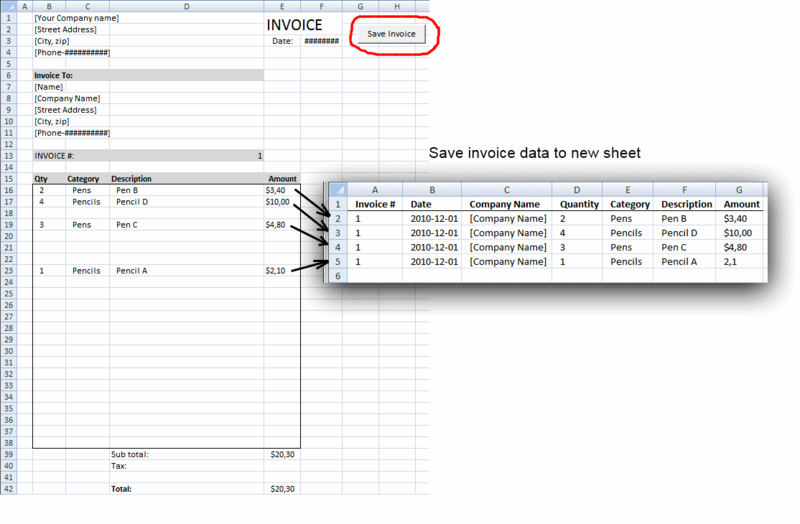 Each time I update the chart, I want it to pull data from the same sheet, same rows, just offset columns. When I insert the combobox at the end of the instructions, nothing is present in the drop down. I was wondering if you would be able to help with that? Select "Design Mode" on the Developer tab, then right click on the combobox and select Properties. 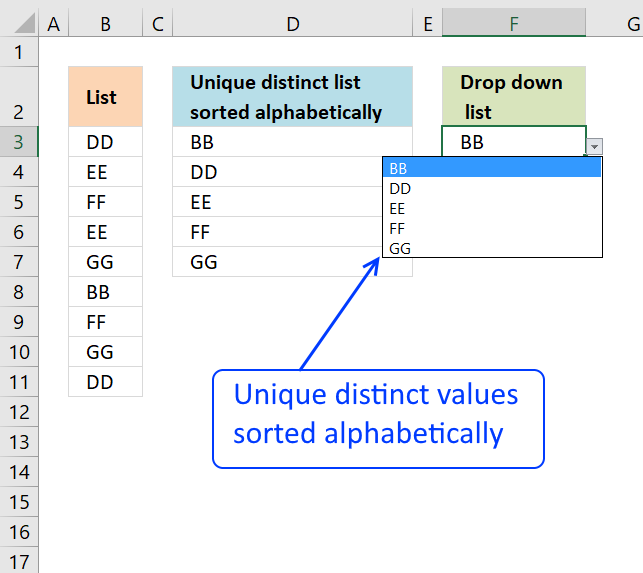 In the ListFillRange field enter the range of cells that hold the values you would like in the dropdown. Close the Properties window, deselect "Design Mode" and I believe you should be good to go. please explain in greater detail or preferably upload a workbook without sensitive data. It works like charm. 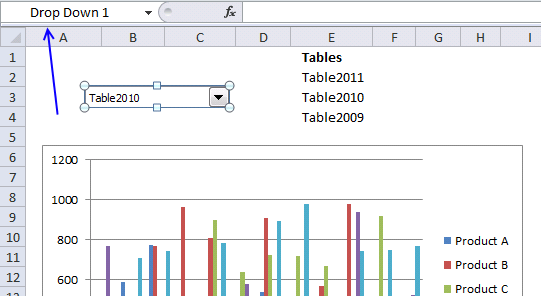 I was just wondering if there is a way to get the vba set the source data in a dual axis environment. Setting the source data on primary axis from the drop down, while leave the secondary axis intact, with its setting, or have another drop down for it? 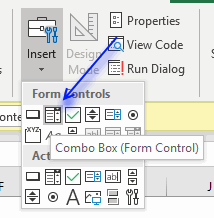 Check the combo box name and that it matches the shape name in the vba code. Your drop down list must be named "Drop Down 1"
Found this thread and I am hoping it is still active. 1. I have four items that need to be in my drop down box, instead of three. 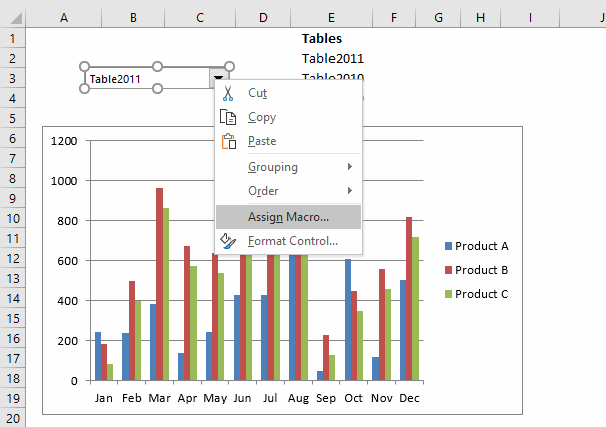 How would you go about adding a 2012 table to the spreadsheet and enable the macro to recognize the new sheet? When I tired I got an error message even though all I did was copy one of the existing sheets and renamed it. 2. 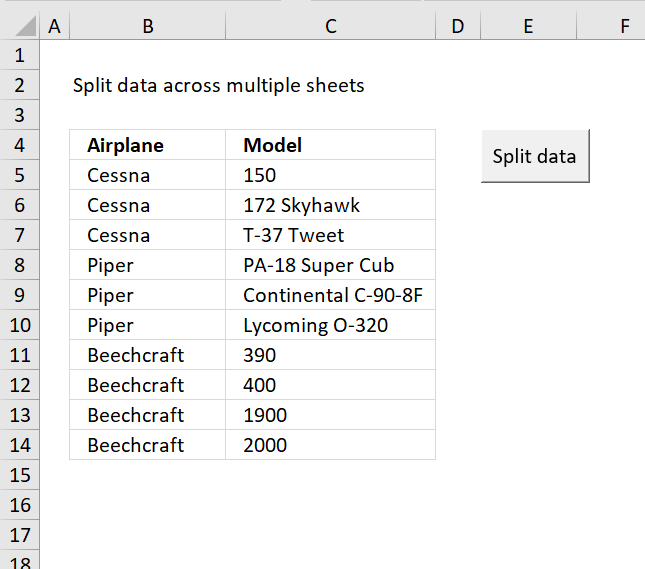 Is there a way that I can rename the sheets using a word rather than a number? For instance, instead of the current name of the sheets (2009,2010,2011), I would like to use the words Gender, Race, etc. Again, I got an error message when I attempted to do this. In fact, I got the same error message in both cases. Add a new table and name the table, not the sheet, Table2012. You can name the tables or sheets whatever you want, almost. 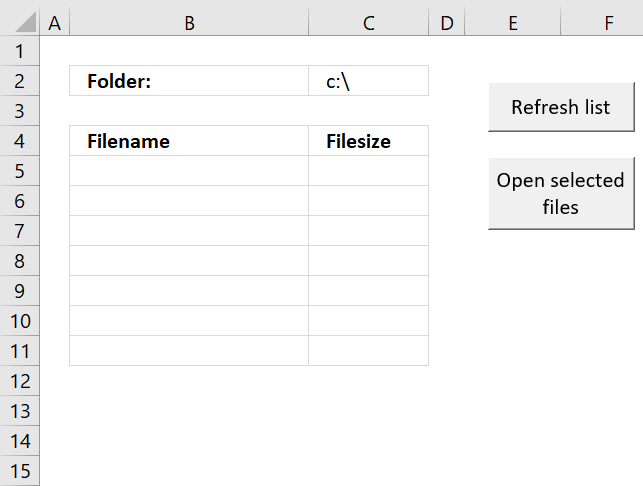 Download this example file, it has a fourth table named Table2012 and it is on sheet2. Hi Oscar, thanks for this amazing article - especially for updating with more basic how to create a drop-down menu it makes it so much more accessible. 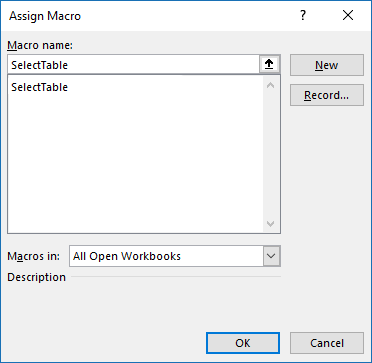 I wanted to know, can this work where your tables are BETWEEN workbooks? Like, you have one Excel file for 2014, one for 2013, etc. I need exactly same thing. BUT instead of Tables, i have Pivot Tables, Which i want to switch as data Source for a Chart. Can you give the Macro for that? A pivot chart or a regular chart?